Nice work caperh. I really like the flame at the top of the candle. The light coming from that candle should have been tinted just slightly with a warm, low saturation tan. You could also have made the candle itself a lighter color. The light from the fire would actually cause the top of the candle itself to glow just slightly. Carrara has the subsurface scatter effect that will provide you with that glow. 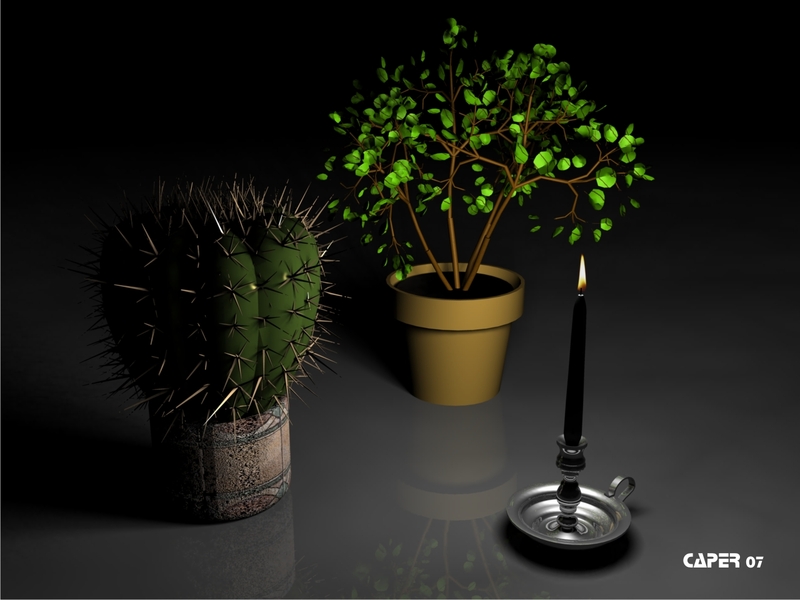 The plants seem well modeled but they are not yet fully textured so they do not look as complete as the candle and it's holder. But so far so good. The models are excellent. I like the cactus, the light on it appears very real to me. I'm less sure about the small tree at right. I miss some bump on the leaves and twigs. Light and reflections on the candle stand are very nice. To get the candle light the way it is in Bryce would be very hard.